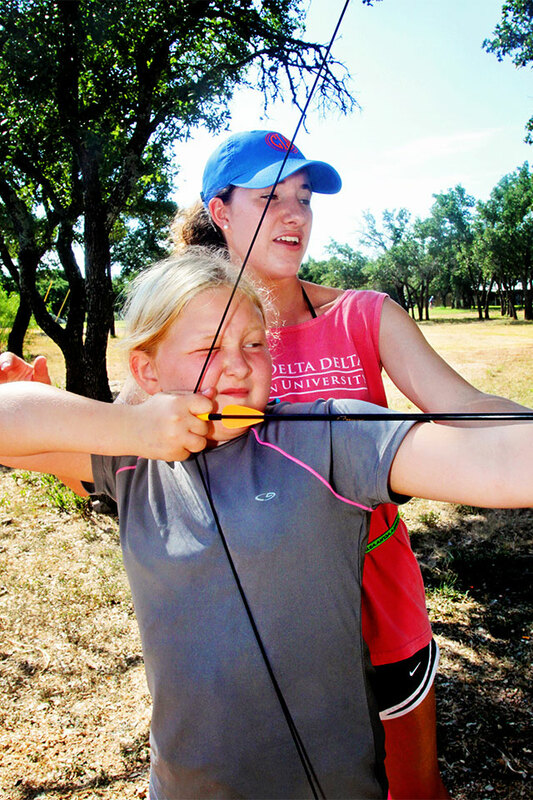 Your job here at Camp Longhorn will provide you with more skills than just being a counselor. Living in a cabin with 12 campers and one or two counselors for two or three weeks teaches you how to get along with others – a social skill that is a necessary part of our daily lives. You will be given responsibilities that put you in charge of designated areas, equipment, activities and events, which will help you learn how to be organized, prepared and perhaps delegate authority. Because of these demands you learn the powerful lessons of patience, self-reliance, perseverance, flexibility and dependability. Not many realize the importance of being a counselor, but to many campers you make a difference. You will live in a cabin (not air-conditioned) with 12 campers and one or two counselors. You will also teach 10 activities a day, each activity being 30 minutes long. Your main focus is to be a positive role model – counselors make the camp and are chosen by their ability to give campers a healthy, valuable, inspirational and fun term. A role model to children of all ages. Clean in appearance, thoughts and actions and totally dedicated to the health, safety and happiness of the campers. What Hours Do Counselors Work? Inks Lake and Indian Springs counselors are hired for one term with an opportunity to work more as Camp receives openings. Since C3 offers one-week terms, there is a possibility of being hired for multiple terms. CLH believes counselors need some time for R&R away from campers and offers regularly scheduled time off. Your director will discuss work responsibilities and liberties with you. What Do Counselors Get Paid? All counselor pay is based on performance, age, number of years at Camp, and responsibilities. In addition to your pay check, each counselor receives room, board, laundry, meals, education, sun and lots of fun. The directors will be more specific. Anyone who enjoys being around kids. We prefer to hire someone with a year of college. We do have a limit on junior counselors (graduates of Chief/Ranger program or a high school graduate). We do have other positions available: office, annual and photography, Pit Stop (infirmary) and food service. Ask a director for more information. We will have a 24-hour counselor school before each term for all summer employees. 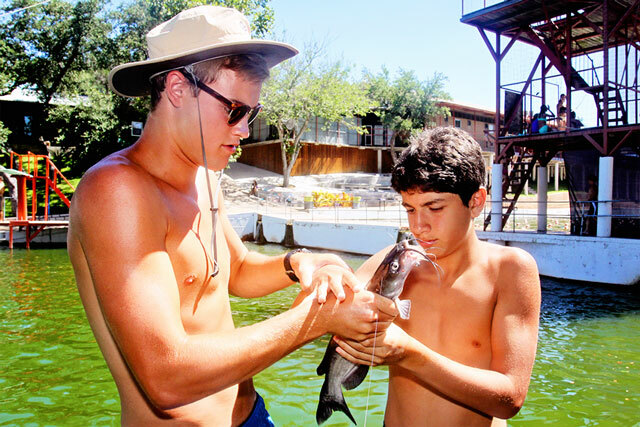 Even though new counselors are a minority group at Camp Longhorn, you are more than welcomed by everyone for the contributions you can make to the campers, for your new ideas, and for the pleasure of working with you. Camp Longhorn is like a big family, with everyone taking care of everyone else. You will have big and little friends on every side to help you through the confusion of the first few days. If you like children and they like you... that's it! Your job here is to provide your campers with a healthy, valuable, happy and inspirational term at Camp. Your cabin campers are the most important assignment. You will be teaching some classes in the activities you checked first and second preference. Activity and cabin assignments are made after your arrival. 1. Complete Application: You can get an application one of the following ways. Apply online using the link below. You can submit your application through our website. Call our office so we can mail you one to fill out and return. Pick one up at one of our Carnivals, College Camp Days or Fall/Spring Interviews. Check our calendar page for details. Note: a resume with a recent photo would be helpful. 2. Interview: All applicants must personally interview with one of our Directors after completing an application. You can interview at any of the following events or locations. Check our calendar page for details. Camp Longhorn anytime. Please call ahead to schedule a time or make other arrangements for an interview.